In an effort to deal with its own waste management problems, China has limited imports of plastic and paper waste — and that’s having ripple effects across the globe. China’s decision to stop taking in much of the world’s scrap paper and plastics has left those wastes piling up worldwide, with ripple effects that can reach as far as your curbside bins. From the late 1980s until 2016, China took in nearly half of the world’s plastic waste, with the European Union and the United States the leading exporters. But as its own population became more prosperous, the Chinese began to struggle with their own waste and pollution issues. So in late 2017, Beijing decided it had had it up to here with your scrap and wasn’t going to take it anymore. Since January, that “National Sword” policy has banned imports of most commercial plastic scrap, such as bottles and packaging. And unless something changes, the world is likely to have big piles of polymer waste piling up for decades to come, according to a new study of the ban’s impact. It’s bad enough that less than 10 percent of the world’s plastics have been recycled, as a 2017 study found. But using trade data from the United Nations, Brooks and her colleagues at the University of Georgia project that other countries will have to find someplace else for up to 111 million metric tons of plastic by 2030 — or make some changes in what we do with the stuff. Brooks said plastic imports increased China’s waste by about 10 to 13 percent. About 90 percent of the imports were single-use items like plastic bottles or food containers. The plastic ban was accompanied by strict limits on paper, with the country refusing to accept shipments of newsprint or cardboard with more than 5 kilograms (11 pounds) per ton of other wastes mixed in. US recyclers say that’s an all-but-impossible standard to meet. 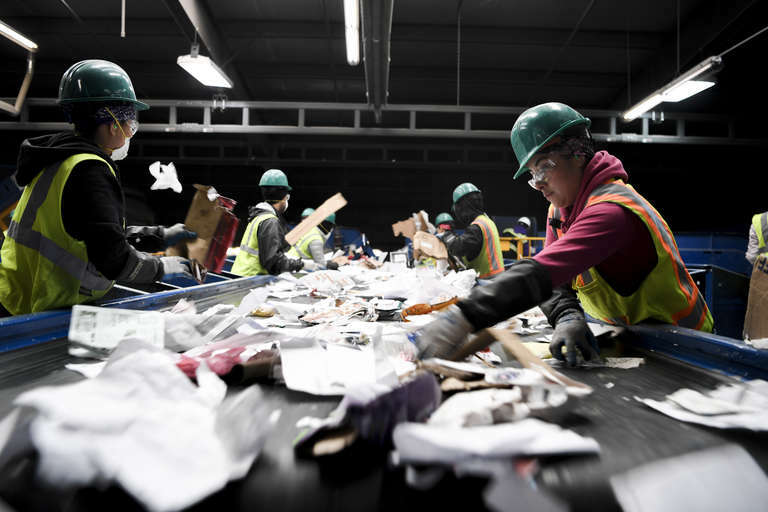 Prices for the material have plunged and processing costs have gone up, according to the industry — and as a result, some of the paper and plastic Americans are trying to recycle are ending up in landfills. Plastic in particular has ben difficult to manage, Marjorie Griek, executive director of the National Recycling Coalition, told Seeker. That’s starting to hit the budgets of cities and counties that promote recycling as well. In El Paso, Texas, the company that handles the city’s recycling has asked the city council for a more than 50 percent increase in fees to cover their costs, said Kurt Fenstermacher, deputy director of the city’s Environmental Services Department. The council has put off action on the request, which would raise the fees paid from about $75 to $115 a ton, Fenstermacher told Seeker. Instead, it’s trying to work with the recycler to help reduce its costs. In a pilot program in several neighborhoods, city inspectors walk the streets ahead of the recycling trucks to inspect the blue recycling bins for non-recyclable items like plastic bags or trash, which can jam up equipment or force the processor to spit out otherwise-recyclable material. When they find them, they attach an “Oops tag” to the bin to remind the household what’s acceptable and what’s not. In Lancaster County, Pennsylvania, west of Philadelphia, between 20 and 40 percent of what ends up in curbside bins is non-recyclable trash, said Kathryn Sandoe, a spokeswoman for the Lancaster County Solid Waste Management Authority. That means the local recycling processor has found about a third of the material it takes in is no longer marketable. Meanwhile, Griek said, materials piling up can become homes to critters like rats or mosquitoes, which carry disease. And plastic piled outside begins to degrade in the sun’s ultraviolet light, making it less valuable. The Chinese ban has spurred a few companies to explore building new plastic recycling plants or expanding existing ones in the United States, she said. A few recyclers are rethinking the common “single-stream” practice of collecting all materials together, requiring households to separate plastic and paper from other materials like aluminum before putting them out to the curb. Others are hiring more people to sort collections. Communities that have “dual-stream” programs where paper and other recyclables are separated end up with in cleaner, more valuable paper to recycle. But most infrastructure, starting with the trucks that collect the bins, is designed for single-stream programs, Sandoe said. Brooks said much of the expected tonnage is likely to end up in developing countries that don’t have the recycling infrastructure that China built, raising the odds that it will end up in landfills there. “I think this is kind of a wake-up call that we need domestic capabilities to manage our waste, and there probably needs to be an economic policy that drives that,” she said. Changing the types of plastics produced, finding new materials or promoting more multi-use items may help head off that wave of debris.